The built in configuration classes for .NET are powerful and incredibly useful but can be quite confusing due to their flexibility. This is a simple example of a custom ConfigurationSection with custom element names and nested ConfigurationElementCollection objects. FIRST: Add a reference to System.Configuration in your project and make sure to add “using System.Configuration;” to the top of your class files. This is the App.Config file the example with comments to explain each important line. The default namespace for this example is 'ConfigTesting' and the assembly name is 'ConfigTesting.exe' or "DefaultNamespace.ClassName, AssemblyName"
The 'Pet' element contains a default collection in the same way as the configuration section. The Toy collection is the one accessed without any extra tags around it. This is an additional collection that must have extra tags around it to show .NET that it is a collection. Defining the section itself is relatively easy. //This makes the collection the default one that is accessed. This is the class referenced in the configSection tag in App.Config. You can see that it has one property which is of type MyPetConfigCollection. The MyPetConfigCollection is a simple class that is mostly generated for you. The CreateNewElement and GetElementKey methods are compulsory and Visual Studio offers to generate them for you but you have to fill in the content. CreateNewElement should simply return a new object of whatever type the collection holds while GetElementKey should return the key of the given object (it’s like a primary key, if you’re familiar with databases) which is defined in the element class. NOTE: Overriding ElementName is how you replace the default ‘add’ keyword with your own string but you must also override CollectionType. This element contains two collections, one is the default collection and the other is specifically named Food. It’s important to note that the in-code name of the property does not need to match the tags/attributes in App.Config. The code names are used in code, the ConfigurationProperty names are used in App.Config. This is the toys collection, which is the default collection (you don’t have to have a default). The ToyElement does not contain any collections but it could if you wanted to add some here. The below two blocks are the Food collection and elements. Finally, here is the test I used in a Windows Forms application to make sure each element was usable. This iterates over each element and I had a breakpoint to pause so I could hover over it to read the contents. 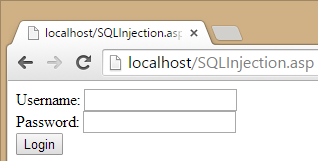 I posted a while ago that I added a page with ASP Classic to show your current IP. 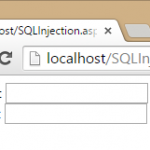 This worked because the site was being hosted in IIS with ASP.NET, ASP Classic, and PHP all enabled but I have now moved to a PHP only host and wanted to quickly get the IP lookup working again (I use it quite often). I can potter around with PHP and would be able to figure it out but I did a quick search to find a converter and discovered this great online tool which did the work for me! It works exactly the same as before but this time it’s PHP. You can try it with the same link: What is my IP? It’ll match a single line to validate an IP or domain name, including any of the new TLDs at the time of writing. I needed a quick way to find my IP without using Telnet so I added https://mcgrane.co.uk/ip to my site. Here’s the ASP Classic code because I was feeling nostalgic. https://mcgrane.co.uk/stepsecurity is a little game I made for you to test your knowledge of some basic security problems in website development. In order to reach the end of the puzzle you’ll need to demonstrate a good understanding of the basic pitfalls that new developers often fall into. 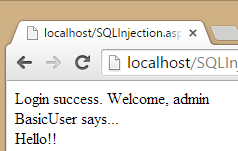 For years I’ve known that SQL injection is bad and how to protect against it. In fact, I’d go so far as to say that everything except the very first classic ASP pages I wrote were safe against malicious SQL but for some reason I’d never actually tried attacking a vulnerable page to see what was really so bad about it. We all know the XKCD comic about little Bobby Tables and yes you could simply drop the tables or database very easily on an unsecured page but what if you aren’t simply bent on destruction? As developers we spend our lives building little hand-holds into application to stop people breaking things, and that’s just for those that aren’t trying to do anything bad! What about those that want to slip in, infiltrate, and hold your organisation to ransom? Here’s a brief example of how easy (scary) it is for one unchecked variable to be used as the gateway to read your entire database. 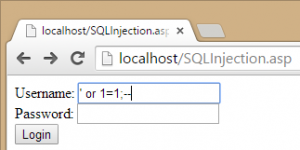 Simply enter a single apostrophe into either field to see if this page is vulnerable. Awesome! Not only is the page vulnerable, it’s got error reporting turned on so I can see the exact part of the query I’m interested in! 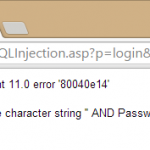 This error is saying there is “unclosed quotation mark” in the query which means the apostrophe we entered has been taken literally by the server and executed as part of the query. Simply because of one extra quotation mark the query fails because MSSQL can’t figure out where each string starts/ends. 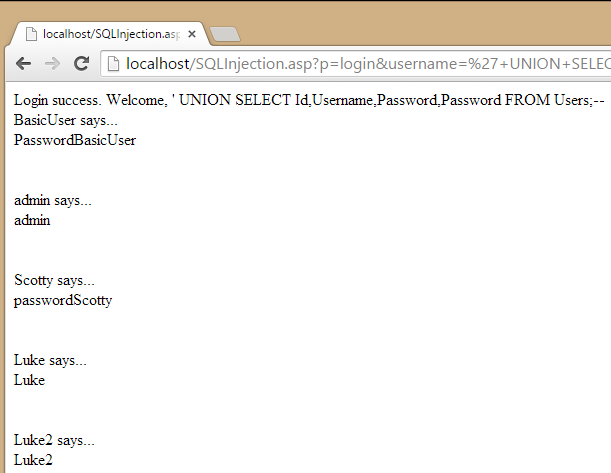 Also, once logged in as admin it seems something else cropped up and it looks like a message from BasicUser. It’s important to note here that the messages sent to the administrator appear because the username and password are both ‘admin’ and would not have shown up otherwise. This is because the example looks for messages sent to a Username so by using the above query to get the password the application would think the password was the username and find no messages logged against it. In conclusion, I hope this shows you that the little SQL bug you have in a project which crashes whenever anyone called O’Leary turns up is absolutely worth fixing right now. 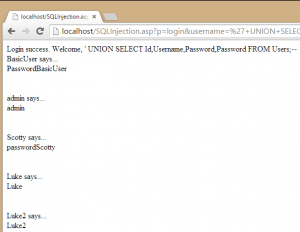 NOTE: I have omitted some details explaining exactly what each SQL query does as this post is intended to explain to a developer why SQL injection vulnerabilities are a critical security flaw, not just something that results in a few errors every now-and-then. UPDATE NOTE: This application was for an older version, do not use it anymore! Here’s the config file to show how simple an applciation this is. Please note that SpamAssasin has a problem with long file names and spaces so it seems to be best to use the shortnames for its location. You can download the application & source code from my projects page here. A while ago I became very interested in virtualization and how Microsoft Virtual PC works. I quickly came up against VHD (Virtual Hard Disk) files and after learning a little about them I realised that you could use them to start learning 32-bit Assembly and build your own bootloader or operating system. All pretty obvious stuff but it all seemed so magical… so I looked for a good interface to let me edit VHD files and couldn’t really find anything that was as visual as I wanted which meant it was time to start coding. After reading the specification for VHD files (which is here) I learned that there are three types of VHD file which are Fixed, Dynamic and Differencing. The most basic of these is the fixed disk type which is just one file with a block of data representing a hard disk surrounded by a header and a footer. The dynamic disk grows by block sizes as you add data to it but never goes beyond the maximum capacity. This is how you can have a virtualized 60Gb drive taking up only 4Gb – it is because the actual space used is only what is needed rather than the full allocation as is the case with fixed virtual disks. I won’t go into differencing disks in this post because I did nothing with them but they are used to represent the differences between an existing VHD and another state of that VHD. A differencing VHD file relies on having a parent which can be a fixed, dynamic or even another differencing disk. All VHD disk types share a common footer format which is detailed in the VHD format specification document but here’s the brief version. Using this table you could build an object to easily read and modify these values from the VHD files footer. Doing this would then allow you to manipulate fixed disks by changing their size (Current Size) or doing other funky things. To save the footer as a fully functional FIXED DISK VHD file you save out the data block as large as needed but in multiples of a ‘block’ size and end with the 512 byte footer as detailed above. When any changes are made you must re-create the Checksum which can be done like so (this is an example from my code, don’t forget that your variables names are likely to be different). There are a few things here to take note of. Firstly, the checksum is calculated by simply adding up all the bytes so this is a lot of lines to do really not that much work. The second is the unary bitwise NOT operator ~ (tilde) as this performs a one’s complement NOT operation on the checksum. If you’re interested in programatically manipulating VHD files this post might help you get started and I would be interested to hear from you if you do something interesting with virtualisation. I may someday finish my VHD project and make a bootloader and if that day comes I’ll post it for download on this site!